If you’re trying to get rid of bad breath, you’ve probably walked down the oral care aisle in your local market or superstore and been confused by the many types of mouthwash, ranging from brands that have been around for years to newer “hybrid” mouthwashes and everything in between. Most promise to get rid of bad breath, but how do you know which mouthwash ingredient is the most effective at getting rid of the bacteria (the culprit!) that cause bad breath odors? Supreme Breath Tru-Active Chlorine Dioxide Mouthwash. Stops bad breath. Active chlorine dioxide mouthwash stops bad breath odors on contact. This active, oxygenated formula attaches itself to the odor molecules and eliminates the stink instantly. Related article: 6 Reasons Why Popular Bad Breath Remedies Just Don’t Work. Most Effective Bad Breath Odor Eliminator. “Active” chlorine dioxide (ClO2) mouthwash is proven more effective at killing bad breath bacteria than popular premium mouthwashes that contain “stabilized” chlorine dioxide. In fact, the stabilized products are stabilized chlorite, and not chlorine dioxide at all! Related article: The Ideal Mouthwash and Toothpaste. Super Tough on Odors, Gentle on Your Mouth. Active chlorine dioxide mouthwash seeks out and destroys the anaerobic bacteria that cause gum disease and bad breath. 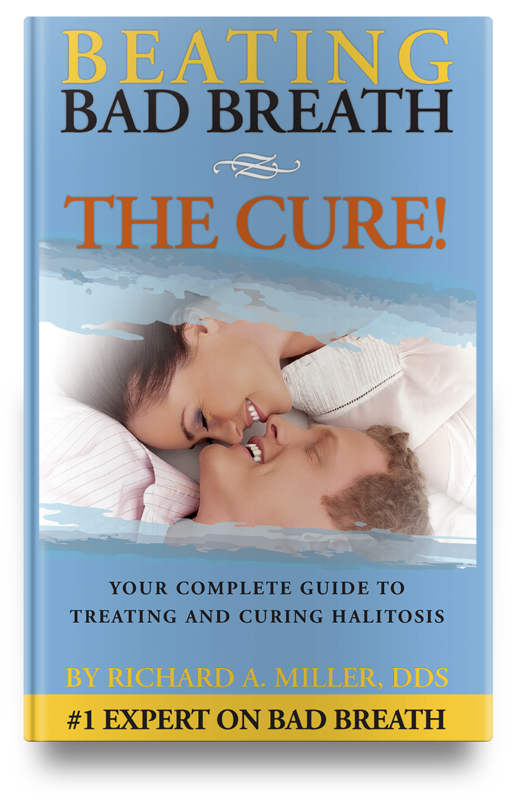 It surpasses Peridex, the most commonly recommended rinse for gum disease by periodontists. Even with all this odor-destroying power, active chlorine dioxide mouthwash remains very gentle on the mouth tissue and can be used daily with complete confidence to destroy odors and odor causing bacteria under the gum which cause bad breath. Related article: Professional or Home Treatment for Bad Breath — Which Option is Right for Me? With a pH formulation similar to mouth saliva, active chlorine dioxide (ClO2) mouthwash is optimized for daily oral use. It is non-toxic, has a pleasant taste (not bleachy! ), and won’t stain your teeth. Plus, the bad breath bacteria cannot build up any resistance to active chlorine dioxide mouthwash. SUPREME BREATH Tru-Active chlorine dioxide mouthwash is recommended by halitosis specialist, Dr. Richard Miller, and is the only mouthwash used at the National Breath Center for maintaining the bad breath Total Cure as it prevents tongue biofilm from forming again. Related article: Bad Breath Balancing Act — 3 Ways to Win the Bad Breath War in Your Mouth for more information on biofilm and bad breath bacteria. YOU can regulate its strength! This is because active chlorine dioxide mouthwash is a two-part system that you mix and use on demand. By simply adjusting the time before each use, you can control the strength of your mouthwash. This is especially useful when you need to create a personalized concentration for different circumstances, such as using in an oral irrigator to kill bacteria and odors under the gums. Plus, since the solution is stored in two separate bottles, it has a long shelf life and does not lose its power like other one-bottle formulations. 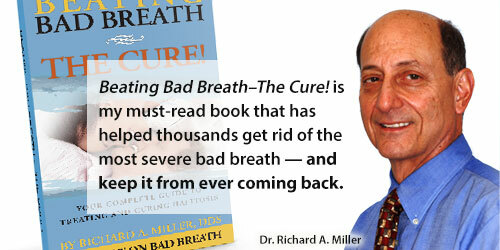 See Dr. Miller’s Beating Bad Breath Protocol for step-by-step instructions on how to get rid of bad breath. Is not chlorine dioxide at all! 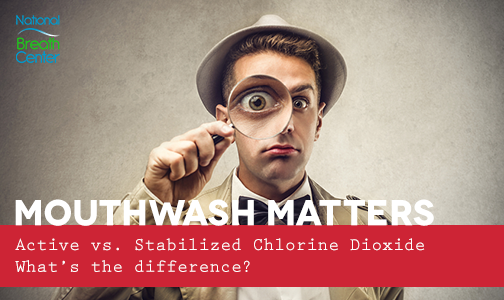 Products that claim to be stabilized chlorine dioxide actually consist of stabilized “chlorite” — which does not have the efficacy of active chlorine dioxide. Less effective odor neutralizer. Bad breath comes back sooner. Don’t Buy Another Bottle of Mouthwash Without Knowing the #1 Most Effective Ingredient for Stopping Bad Breath! 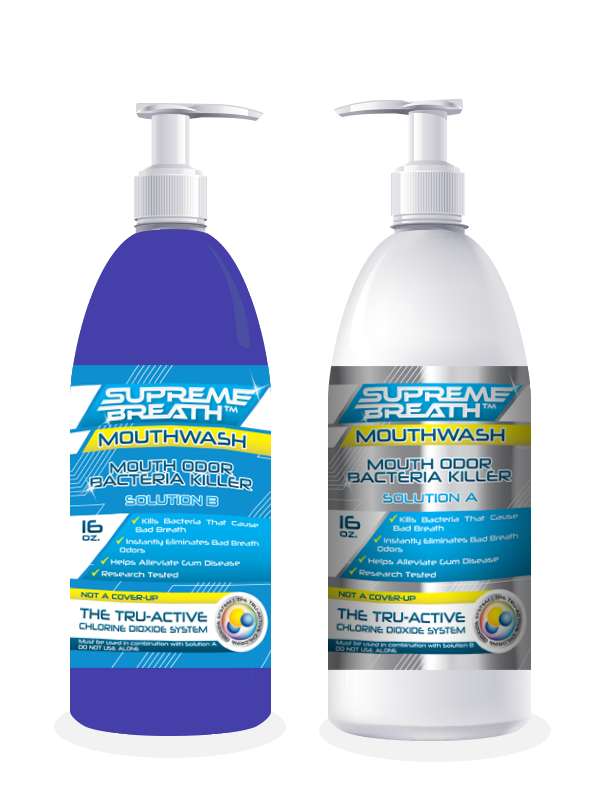 SUPREME BREATH Tru-Active chlorine dioxide mouthwash is recommended by halitosis specialist, Dr. Richard Miller, and is the only mouthwash used at the National Breath Center for maintaining the bad breath Total Cure as it prevents tongue biofilm from forming again. Contains everything you need to eliminate bad breath.